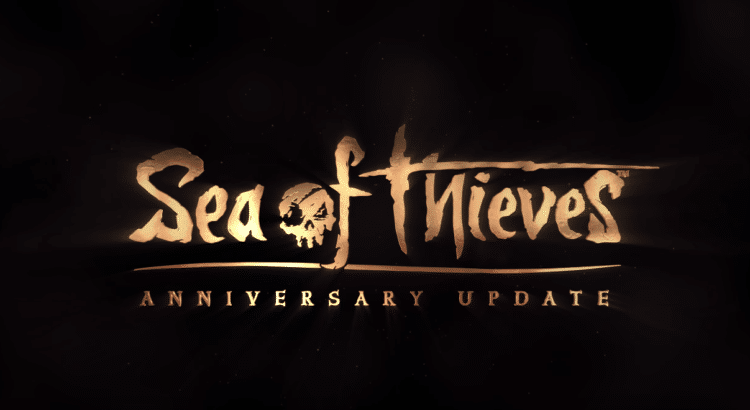 Today marks the one year anniversary for Sea of Thieves! No better day than today for Rare to give a tease of what we can expect for the future of Sea of Thieves. While much of the community expected to get a glimpse of the new Arena mode, there were plenty of unexpected, never-before-seen or talked about features showcased in this incredible trailer. 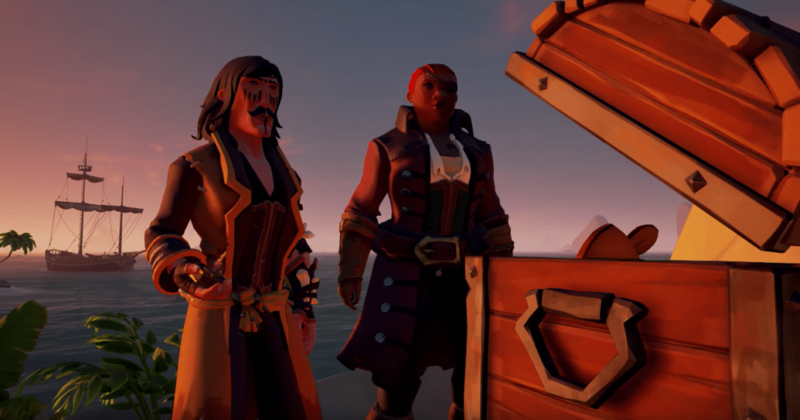 Below we point out the major features catching our eye, and what these features might mean for the future of piracy in Sea of Thieves. At the very beginning we see pirates around a campfire and cooking pan holding a fishing rod with a fish attached. One of the biggest features asked for since the beginning can all but be confirmed just in this one scene. 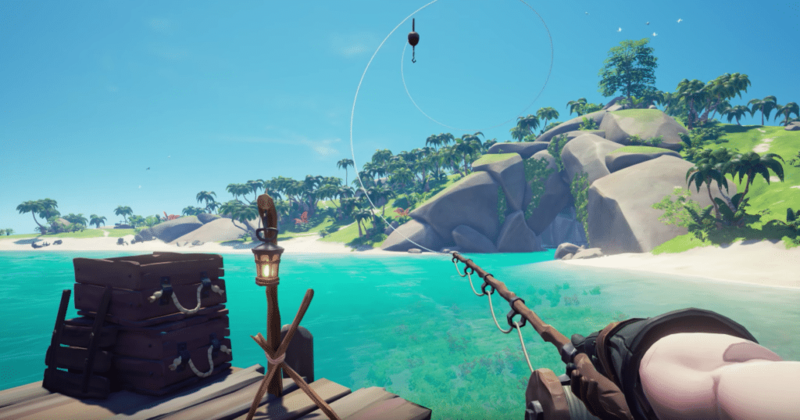 Fishing is coming to the Sea of Thieves! Anniversary Trailer Tease #2: The Opening Chest! 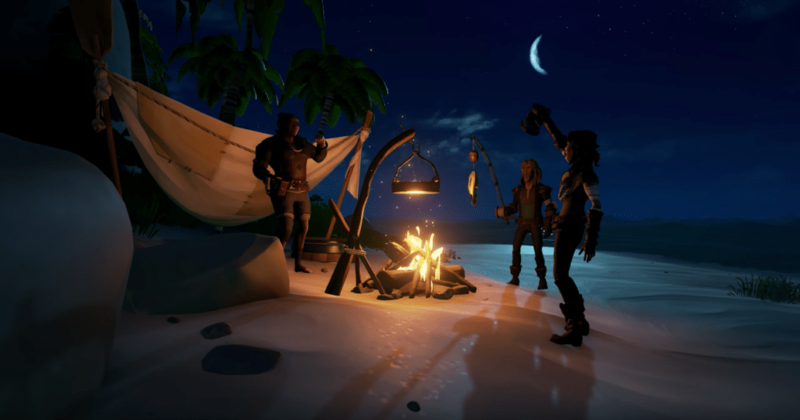 The next scene should catch any veteran Sea of Thieves player by surprise. Yes, that actually just happened. The Chest Opened! How did it open? Why did it open? What was inside? We have no idea. We do, however, think this new mechanic could definitely shake things up. 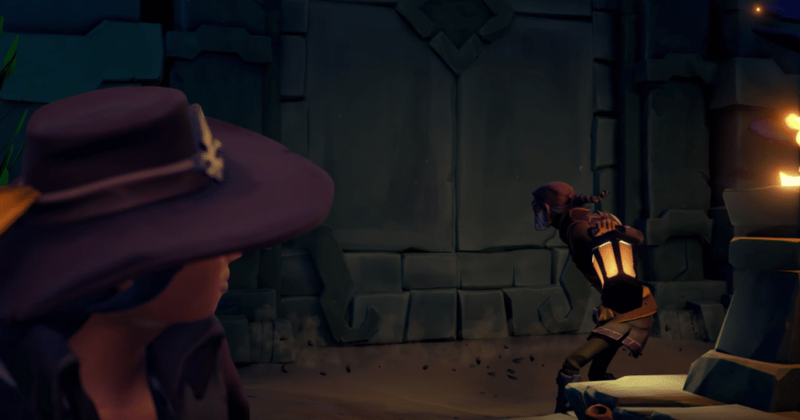 Anniversary Trailer Tease #3: What’s that at the front of the galleon? As the trailer moves to the front of this galleon, we are treated to several new goodies. First, our eye is drawn to the fishing rod again, though this time in action! It’s nice to know some of our crewmates might be doing something a bit more constructive while standing at the bow, rather than merely neglecting the sails. Second, we can’t help but notice the two new weapons on each side of the fisherman: they appear to be harpoons! 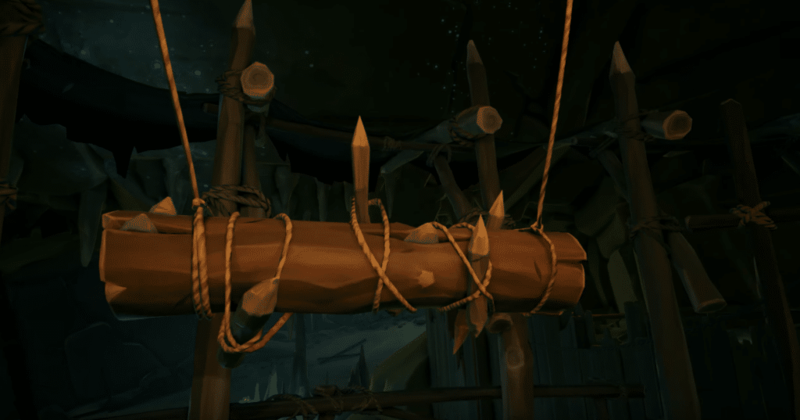 Harpoons have been a long requested and rumored addition amongst pirates on the Sea of Thieves. We’ll soon see who actually has what it takes to wield these beauties to their full advantage. Third, there is a pirate behind the fisherman, who seems to be too wrapped up in that book she is holding to be as excited as we are to see harpoons on the ship. What is this book? Is this a ledger? Is this lore? This is yet another big game changer: enhanced ship damage! We see one galleon take cannon fire from another. 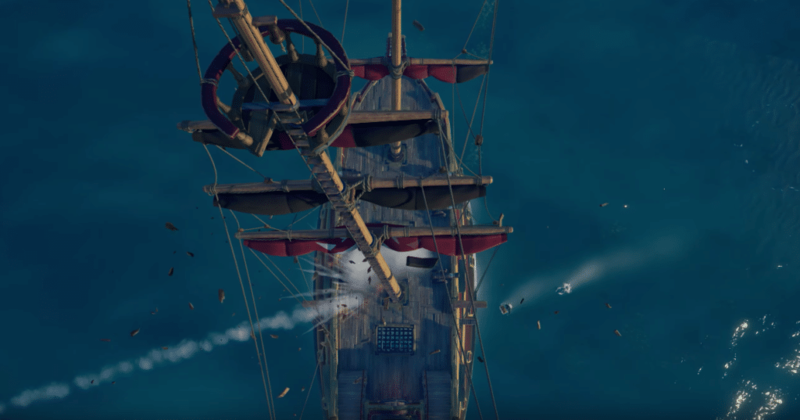 With expert precision, three cannon shots lay waste to the middle mast—causing it to fall down! Time to practice your skills as a cannoneer. The ability to pinpoint masts on other players’ ships will add another layer of strategy during combat—offensively and defensively. After all, we have yet to see how the crew with the damaged masts can deal with it. Hopefully, it isn’t something that some wooden planks can’t fix! Time for some shots of the Arena! Of course, we see two ships duking it out. However, in the foreground we see what appears to be an immobile ship. Those scant and tattered sails would not be much use for sailing. There is also a wooden dock attached to this immobile ship. This would make is seem that other boats might dock here, and that players might board. Indeed, we do see players boarding this ship, as well as two players sword fighting on the deck. At the very top of this ship we also see the beginnings of a red smoke plume. Another such plume can be seen off in the distance. 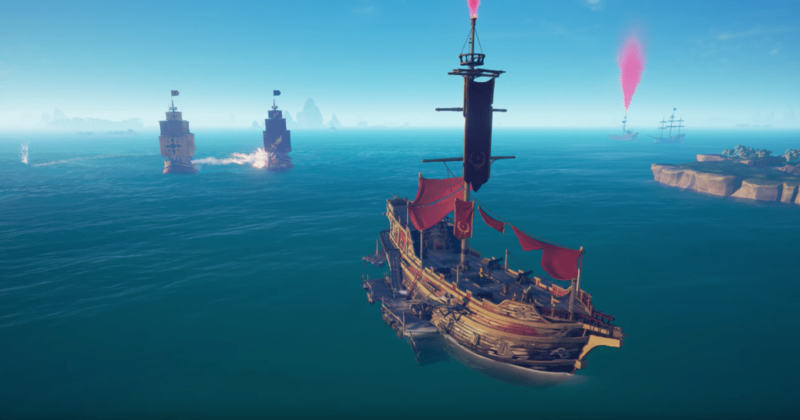 Perhaps these ships act similar to current skull forts? Maybe they have something precious that everyone playing would want and its visibility will make it a big point of contention. Perhaps—like a miniature outpost—it has a stockpile of much-needed resources. Shortly after we see several banners being lowered. It has a ceremony feeling about it so this could be the ending sequence to a match showing which teams won? What do those emblems mean? On the lowered banners we see a shark, a sun, and a flaming sword? Plus, another banner shows up at several points in the video—including at least three places within the picture below—with what appears to be a rather majestic looking bird emblem. Moving on from Arena, we now get a glimpse into the long rumored Tall Tales. 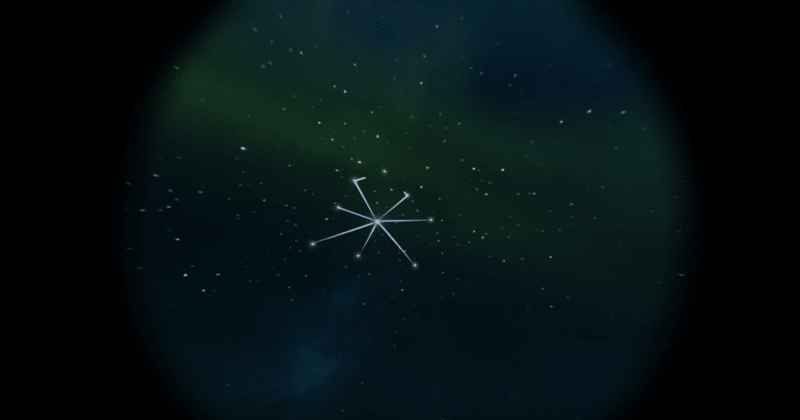 The small bits we get to see look like the Riddle quests on the next level. More like several levels. We see constellation clues, trapped doors, and swinging beam traps. Adding more elaborate clues and traps to quests has been a long requested community feature. 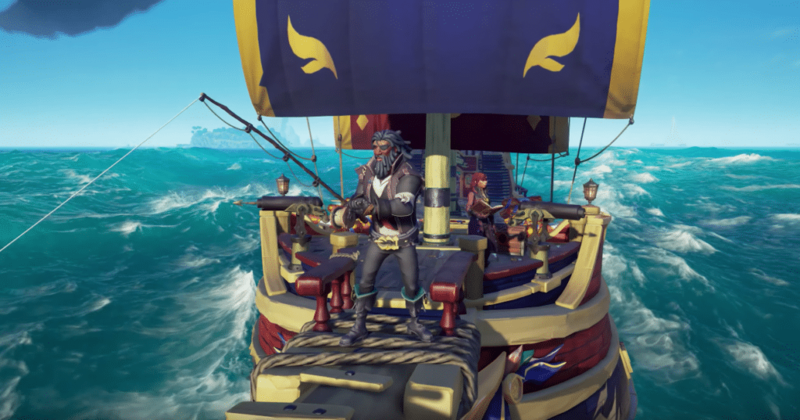 Actually seeing it with our own eyes in Sea of Thieves fashion is a true treat. More fishing! 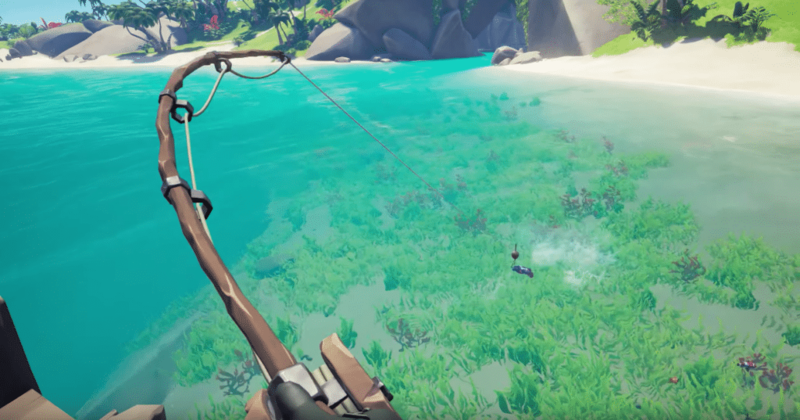 This time we get to see what fishing will look like in first person. The player in the trailer even has a fish who took the bait! Presumably, the fishing rod was simply insufficient for catching a meg. 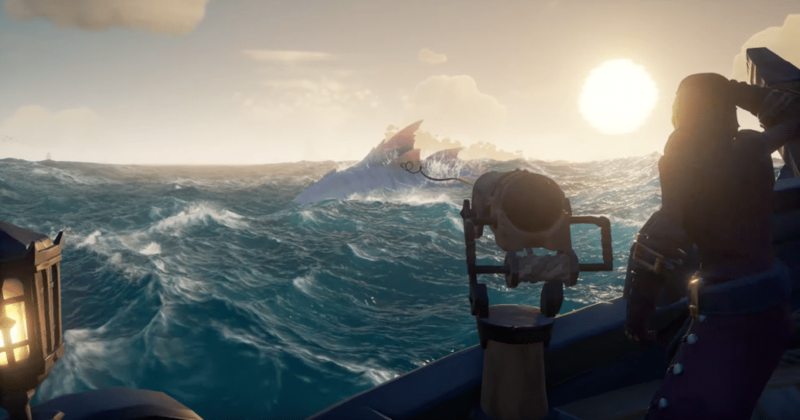 So, while we saw a glimpse of the harpoons earlier, the trailer now shows them off in action on a megalodon! We can’t help but wonder for what other purposes we might use this new toy. Will we be able to attach the harpoon to other ships? Regular sharks? Players? We will have to wait and see. When is all of this amazing content coming to the Sea of Thieves? Those are the big features that we caught while watching the Anniversary Update trailer. If you saw something we didn’t mention, leave a comment below! Also, if there is something you are particularly excited about, we would love to hear about it. This update definitely looks to be holding up to the mega update anticipation surrounding it. We can’t wait to see more, and we will be sure to let you all know when more is revealed. the book being read is probably part of “Tall Tales”. it makes sense to assume that longer, more complicated quests need larger things than simple pieces of parchment. The Ship Plumes strike me as a sort of “capture the point” thing. i assume that once a group of pirates capture a ship the smoke changes colour somehow. the longer the smoke is your colour, the more points you get and the longer your team banner will be at the awards. 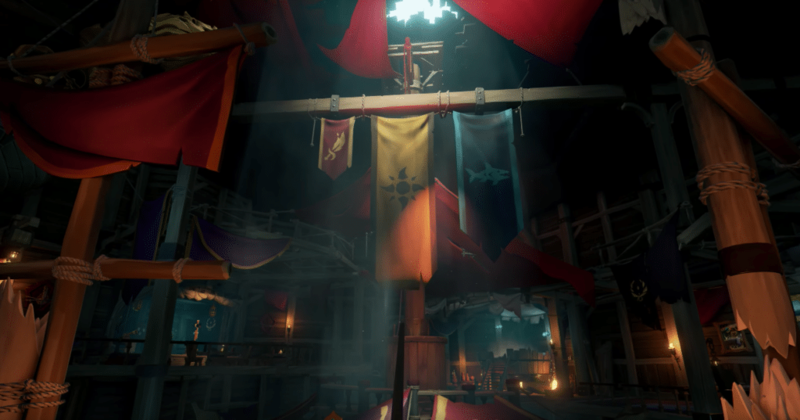 oh and i forgot to mention if you have a look you can see that the banners match the sails of the ships in the arena and the clothing of the crews. obviously, the crews get kitted out in a “uniform” and the sun team won. the banners ARE unfurled in a podium like layout after all. the pirate with the yellow coat and golden sword (the forsaken ashes belt puts her in the flaming sword team) we saw on the ship must have lost as their team is the shortest banner. Good spot with the banners matching the sails!